Our Bou Babies quietly sleep in the nursery dreaming of who their new families might be. We try our best to make your dreams come true by bringing you these precious little Persians and Himalayans for sale. Each one is unique and all are as sweet and cuddly as can be. Be sure to read the Application Process page and let us know if you have any questions at all. We are here to chat at any time 260-420-4224. Completing our Application is the first step toward making your Bou Baby's dreams come true! 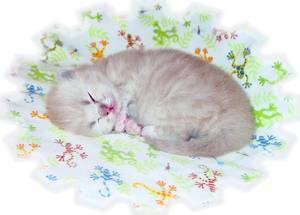 And finally, we have a page full of information that will be very helpful in preparing for Bringing Your Kitten Home. The section on the Safe Room is especially important!